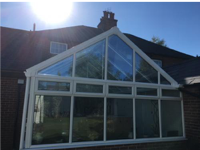 Our conservatory design and installation team are specialists in a range of styles including the Gable-End. Contact us to discuss your project with our fitting and design experts. The Gable-end style conservatory boasts stylish front elevations with windows that extend right to the apex maximises the amount of natural light flooding the room, while the height of the room gives a good feeling of space.